Eagles injury concerns: which player's recovery is most essential? Carson Wentz was honored with a (not real) MVP award. As we explored earlier this week, the Eagles are far from healthy as they begin to prepare their Super Bowl title defense, with rookie mini-camp kicking off last week and full team OTAs set to start next week. A bevy of big, important names won't be suiting up with the rest of the team as practices start prompting many to start worrying. Of the 10 Eagles players coming back from offseason surgery, which ones should concern Eagles fans the most? 1. 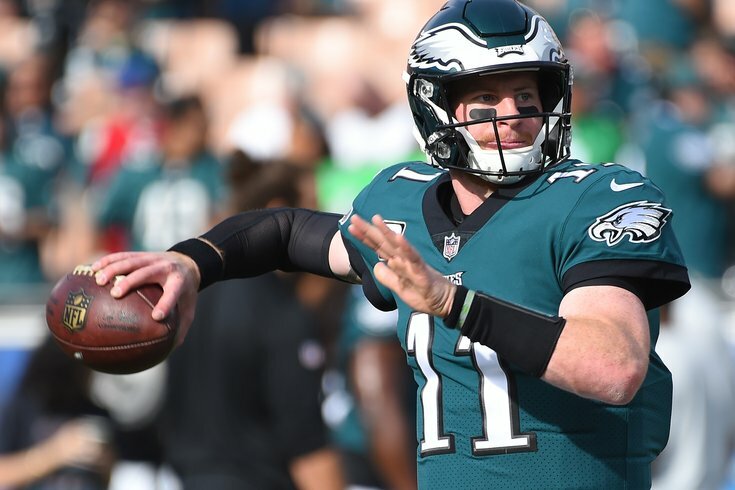 Carson Wentz, QB: Wentz is top on the list for obvious reasons and his availability to start in Week 1 is up in the air. His recovery time should get him ready to suit up and take snaps toward the end of training camp but will he be ready to go against the Falcons? It seems clear he will not be playing in the preseason, which didn't really stop him in 2016. He had surgery after his Week 14 ACL and LCL injury and has been throwing and running. Nick Foles is ready to go in his stead, but the potential MVP talent of Wentz makes him the most important injured Eagle right now. 2. Timmy Jernigan, DT: Jernigan isn't the most important defensive lineman on the Eagles' roster but with Fletcher Cox commanding so many double teams, Jernigan is essential to their pass rush and run stopping. Thankfully, Haloti Ngata's offseason signing will take some pressure off, but recovery time for a herniated disk is four-to-six months so he will not be ready week one. The severity of the injury lands him second on this list. 3. Jordan Hicks, LB: Hicks anchors one of the Eagles' few week spots (or weaker spots) at linebacker, though the return of Nigel Bradham certainly helps. The linebacker hasn't played since Week 7 but when he's on the field he's a game-changing player and his recovery from surgery is ahead of schedule. He's been oft-injured before, so the more time he can get practicing the better for Philly. 4. Alshon Jeffery, WR: Jeffery's injury came a surprise after the Eagles won Super Bowl LII, as he had played very well all season long — much of it with a torn rotator cuff. Jeffery will not be playing in OTAs or minicamp, but is optimistic he'll be ready to play sometime near the opening of training camp. How does this effect the offense? Well if he isn't ready to go at full steam the receiving corps looks a bit thinner with Nelson Agholor and Mike Wallace the other top options. 5. Brandon Graham, DE: Graham's injury is minor — a small ankle surgery — but he was one of the most important players on the defense last year making life hell for opposing quarterbacks (most important of those Tom Brady back in February). Graham's return as a locker room leader can't come soon enough. 6. Jason Peters, OT: The caliber of players on this list continues to stay at a high level, and the only reason Peters, a future Hall of Famer is ranked sixth is because he was replaced seamlessly by Halapoulvaati Vaitai after his Week 7 injury (torn ACL and MCL). Will Peters at age 36 be able to return to Pro Bowl form? The sooner we see Peters at full strength the better for the near-over the hill lineman. 7. Mychal Kendricks, LB: Kendricks had minor ankle surgery and should be back sometime soon which is good. As mentioned before, aside from Bradham the Eagles have some questionable depth at linebacker with Joe Walker, Paul Worrilow and Corey Nelson as the next three up. 8. Derek Barnett, DE: Barnett should be pretty much ready to go after sports hernia surgery after the season ended, which is good as the second year player looks to become an impact player. 9. Chris Maragos, Special Teams: Maragos is a really important part of the Eagles as their special teams expert and sometimes back up safety. Since he isn't at an impact starting position he falls to ninth on the list. His knee was operated on after Week 6 and his recovery time isn't clear. 10. Darren Sproles, RB: Sproles looks to be close to ready to go. He was injured in Week 3 last year, a season he proclaimed to be his last in the NFL. Anything he can give the Eagles in his unexpected return would be a bonus.